The Addington Article: Duffy Rhubarb Huge Hit!!! 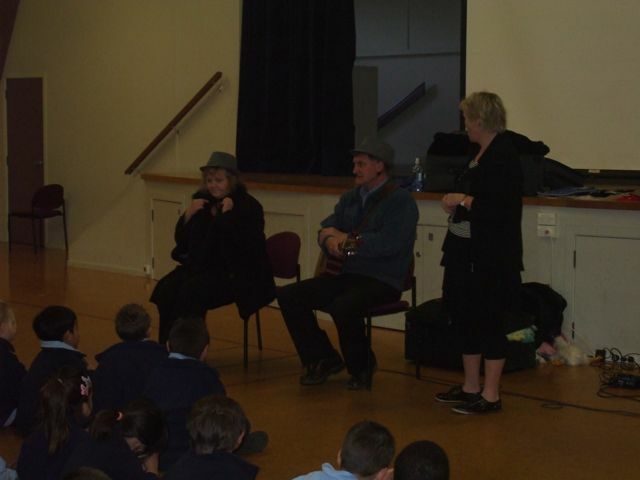 Today we were visited by Mary Kippenberger and Peter Charlton-Jones who spend their time travelling the globe telling stories, singing songs, debating, and presenting drama and music workshops. Together they are "Rhubarb"! 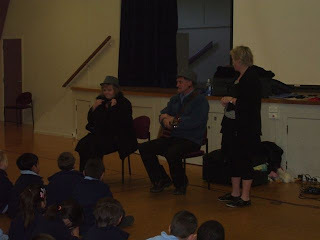 At our school they sang and told stories that involved lots of the children, (and some startled adults), dressing up and acting out the parts. The children and adults present were spell bound and there were some fantastic performances from our new school actors. Rhubarb are Duffy "Role Models" visiting school assemblies around the country. It was a fantastic assembly and thoroughly enjoyed by everyone. Thank you 'Rhubarb' and thank you Duffy. Gareth Parr from Agility Logistics (our Duffy sponsor) was also present at the assembly and helped 'Rhubarb' present some of the Duffy books. 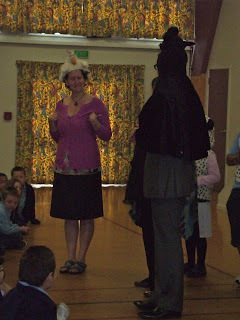 Gareth was also pulled into the stories and dressed up beautifully as a bad wolf. A huge thank you to Gareth and Agility Logistics for their generous sponsorship of our school. hey Guys thanks for having us. You rock!